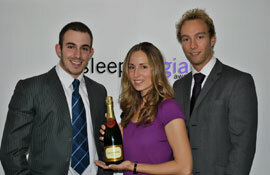 Happy Birthday Sleeping Giant Media!!! Today, 24th of September, we’re celebrating our first anniversary and we would like to thank everyone working for and with us and generally all the people who have been a huge support! This first year has been a great success. All the work and effort we put into building up the company have paid off in every way, and therefore we would like to take this special day as an opportunity to fortify our commitment and dedication to our clients and agency partners. We’re excited about the upcoming year and we’re looking forward to continuing the success we have seen so far.